Since the release of the excellent Tamiya Double Cardan drive shafts there was the possibility of them wearing against the hub carriers. The new part (on the left) is 0.7mm lower with more space for the driveshaft. 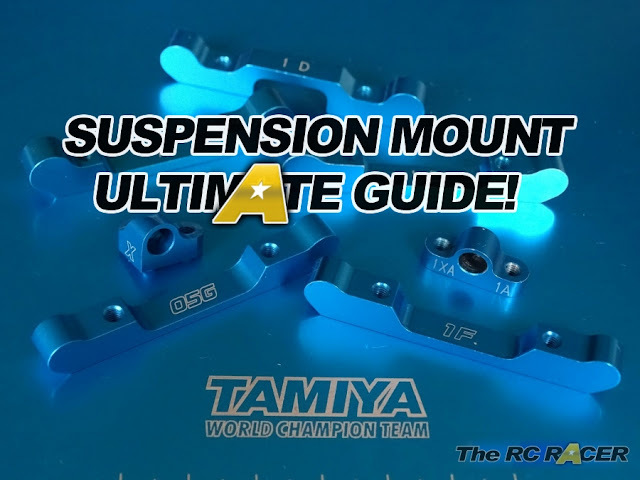 Well now Tamiya has fixed that with new replacements that are much wider, and they also offer more tuning capabilities. As you can see above there is a lot more space for the drive shaft to move around. There is no Left or Right marking on these hubs, you just have to fit them with the more curved side facing towards the front of the car. You now have to place the 3x0.7mm shim on the upperside of the kingpin to have the same geometry as before as the new hubs are 0.7mm shorter. This makes it a lot less finicky to change the hubs as fitting the shim was always one of the more stressful activities when working on the car. This is a good change, as I have noticed that the 418 is really sensitive to roll height adjustments, and having the combined 1.2mm height under the kingpin gives you more options to modify your roll centre on the front end. Needless to say the car handles the same, I have raced the car for several meetings and they have held up with cracks or other issues. These are not essential, but when replacing your spares I would consider these for the extra tuning range and also the elimination of your driveshafts rubbing. Thanks for letting us know these are available, are they compatible with the TRF417v5 as well as the TRF418? since there is no L/R marking I initially had this mounted the reverse, but by looking at it I realized it couldn't possibly. Thank you for the confirmation. I had no idea about moving the spacer so I was about to leave it off.